On a typical day on the mountain, your guide will wake you up between 6:00 and 6:30 (depending on the day) to a hot drink and warm water for a wash. After that, you’ll need to get your kit and other belongings packed. Breakfast is served between 7:00 and 7:30, (again depending on the day). while the team packs your tent away, ready to be taken to the next camp. As you eat breakfast, your guides will brief you on the plan for the day’s climb and perform a health review for each client. They will also address any questions or concerns you may have. Ideally, you’ll be on the mountain between 8:00 and 8:30 each morning. Our aim is to be one of the first groups to leave camp in the morning so that we have the mountain to ourselves. Your porters will finish striking camp as you set off, and will leave some time after you do. Despite this, they will pass you at some point during the day’s hike and have your camp set up and waiting when you arrive. When you arrive at the next camp, there will be hot water for a quick wash, and hot drinks and snacks waiting. 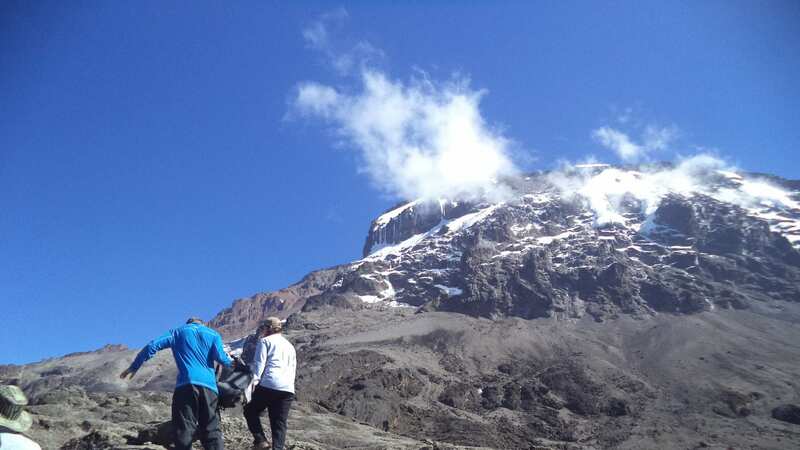 You will generally have time for a short acclimatization trek before dinner, where you will venture up to a higher altitude and have a chance to get used to hiking in more strident conditions before returning to camp for dinner and a rest. As we say, ‘walk high, sleep low’. After dinner there will be time for a debriefing on the day’s climb with your guides, for example, how the weather is expected to be, how the terrain will be, how you will have to dress etc. Also you will discuss anything that might be on your mind. If you are having any trouble or discomfort, please do let your guides know. Most problems can be sorted out easily on the mountain, but only if you let us know! SUMMIT NIGHT: When you arrive at the base camp for the final preparation, you will have an early dinner and be briefed on how to dress for the summit. On this day you will go to bed earlier than other days. You will be woken up at 11:00 to get ready to leave for the summit at mid-night. Before leaving you will have a light breakfast.